Dozens of children were killed after being buried by a mudslide that slammed into their church during Indonesia’s earthquake-tsunami disaster with more than 50 others still missing. Rescuers discovered the bodies of 34 students buried in the landslide, Indonesia Red Cross spokeswoman Aulia Arriani told AFP news agency on Tuesday. “A total of 34 bodies were found by the team,” Arriani said, adding 86 students had initially been reported missing from the Bible camp at the Jonooge Church Training Centre in Sigi Biromaru district. The extent of the devastation caused by the earthquake and tsunami on the Indonesian island of Sulawesi should become clearer on Tuesday, as rescuers push into remote areas that have been out of contact for more than four days. Friday’s earthquake-driven tsunami has killed 844 people as fears grow the death toll may be far worse. Most of the dead so far were in Palu, the main city in the disaster zone. With communications down and access by land disrupted, teams struggled to reach communities closer to the epicentre of the 7.5-magnitude earthquake that triggered tsunami waves as high as six metres. Nigel Timmins, Oxfam’s humanitarian director, said 2.4 million people live in the affected area and it could take weeks to realise the full extent of the disaster. He was on the scene in Indonesia’s Aceh after the 2004 earthquake and tsunami killed more than 130,000 there. “It’s not just a wall of water, it’s a wall of water full of debris: concrete, trees, cars – everything being churned around like a giant cement mixer. It’s like a huge bulldozer that clears away the land and afterward you’re left with complete chaos,” Timmins told Al Jazeera. About 1,700 houses in one Palu neighbourhood were swallowed up, with hundreds of people believed buried, the national disaster agency said. There was also mounting concern over Donggala, a region of 300,000 people north of Palu and close to the epicentre, and two other districts – with a combined population of about 1.4 million. Initial reports from Red Cross rescuers who had reached the outskirts of Donggala district were chilling. “The situation in the affected areas is nightmarish,” Jan Gelfand, head of an the International Federation of Red Cross and Red Crescent Societies (IFRC) office in Jakarta, said in a statement. “The city of Palu has been devastated and first reports out of Donggala indicate that it has also been hit extremely hard by the double disaster,” Gelfand said. So far, nearly 200,000 people have been displaced and are in need of emergency help, while thousands have been streaming out of the stricken areas. Chief security minister Wiranto said on Monday the government was trying to meet survivors’ immediate needs and would accept offers of international help. “Right now, we need emergency aid,” Wiranto said, referring to the foreign aid that would be airlifted to Palu, 1,500km northeast of Jakarta. About 3,000 people thronged the airport hoping to get on any flight and officers struggled to keep order. Wiranto said a navy vessel capable of taking 1,000 people at a time would also be deployed to help with the evacuation. Numerous aftershocks have strained survivors already frayed nerves. 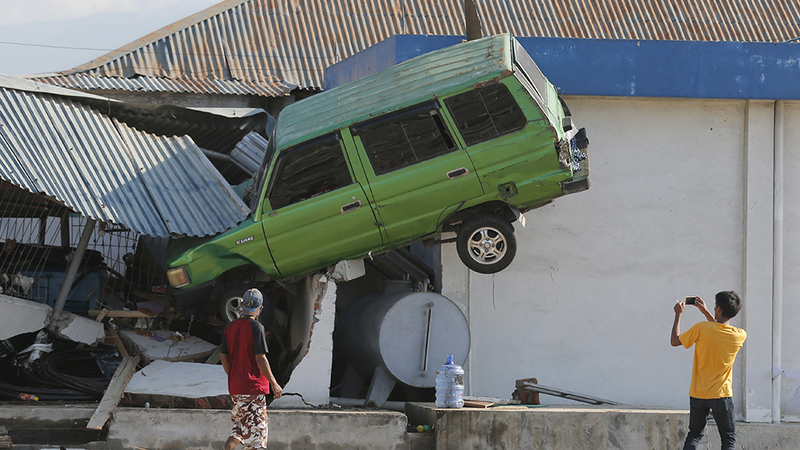 A 5.9-magnitude temblor struck near the southern Indonesian island of Flores on Tuesday. Which of ‘Maniac’s’ pill hallucination stories was the best?